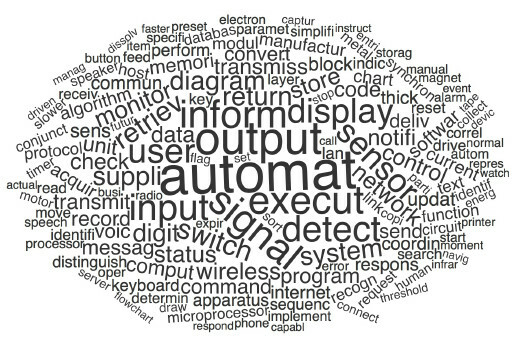 The most important tokens are 'automat' and 'output' (see Figure 1). While these are fairly general, the algorithm also puts weight on more specific engineering terms such as 'microprocessor' or 'motor' and action verbs like 'detect' and 'execut'. 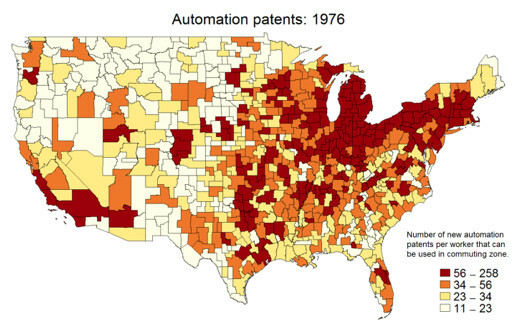 Acemoglu, D and P Restrepo (2017), "Robots and Jobs: Evidence from US Labor Markets", NBER Working Paper No.23285. Autor D H, D Dorn and G H Hanson (2015), “Untangling Trade and Technology: Evidence from Local Labor Markets”, The Economic Journal 125(584): 621-646. Autor, D H, H Levy and R J Murnane (2003), “The Skill Content of Recent Technological Change: An Empirical Exploration”, Quarterly Journal of Economics 118(4): 1279-1333. Bartik, T J (1991), Who Benefits from State and Local Economic Development Policies? Kalamazoo, MI: W.E. Upjohn Institute for Employment Research. Graetz, G and G Michaels (2015), “Robots at Work”. CEPR Discussion Paper 1335. Gregory, T, A Salomons, and U Zierahn (2016), “Racing with or Against the Machine? Evidence from Europe”, ZEW Discussion Paper No.16-053. Griliches, Z (1990), “Patent Statistics as Economic Indicators: A Survey”, Journal of Economic Literature 28: 1661-1707. 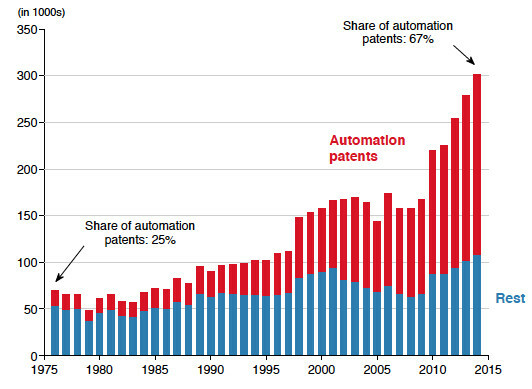 Mann, K and L Püttmann (2017), "Benign Effects of Automation: New Evidence from Patent Texts", Unpublished manuscript. Silverman, B S (2002), Technological Resources and the Logic of Corporate Diversification, Routledge.